Philadelphia Intl. - Tampa Intl. Perfect location. Clean, and great customer service. 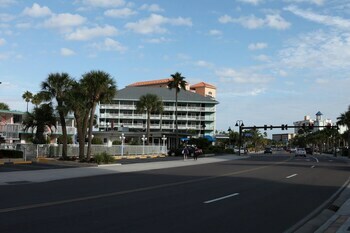 Walkto the beach and restaurants. Friendly staff. Clean. Spacious rooms. Pool access. Beautiful view from the second building. Rooms are older but very very clean! Beautiful views Nice hotel that is close to the beach and great place to get away from it all! 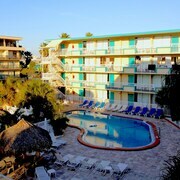 Great location at a affordable price Everything was pretty smooth. Pool with a great view of the harbor. Room was clean and perfect access to the beach. Only thing I was unhappy with was I had to swipe the room key 5 to 10 times before it would work. Other than that great stay. You don't need to be loaded to travel, but you should be rich in knowledge about the destination you're going to! 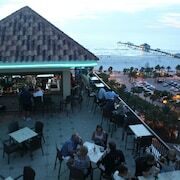 So, are you ready to learn a thing or two about Clearwater Beach? You'll find it approximately 190 miles southeast of Tallahassee, the state capital of Florida, and about 2 miles west of Clearwater. Art and culture don't have to hurt your hip pocket! At the Dunedin Fine Art Center you can select from a variety of free events — why not peruse the program and lock something in? Eager to immerse yourself in the past? If you love getting a sense of the local history through its landmark attractions, add Serenity Gardens Memorial Park to your itinerary. You can discover a few things about a place by slipping on your comfiest shoes and exploring by foot. So why not head in the direction of Sunsets at Pier 60? Could you do with a moment of quiet reflection to take a break from the tiring pace of vacation sightseeing? Plan an outing to Church of Scientology! If you want to tour the inside, check its opening hours ahead of time just to be safe. Why not grab a bucket and comb the shore for treasures at Pier 60 Park? From intricate shells to bits of sea glass, you just never know what you'll hit upon lying along the shoreline. CheapTickets will turn your cheap getaway dreams into realities. Looking for budget accommodations, flights and experiences? You've come to the best place. And remember, we won't make trade-offs on quality. Would you like a world of options on flights and accommodations? Our 500 partner airlines and 500,000 worldwide properties are sure to deliver. 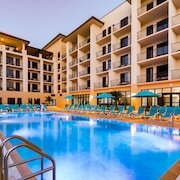 You can also save as much as $481 when you combine your bookings into a package. The less you pay the better you'll feel, and with our Price Guarantee you'll be feeling super. It works like this — we'll refund the difference if you find your vacation package at a lower cost within 48 hours of booking. Not only have we got great deals, we've got some amazing rewards as well. With our simple program you can save heaps of dollars on subsequent CheapTickets hotel stays. All you have to do now is book a flight! You're just a couple of clicks away from a membership with a loyalty club that actually has rewards you'll use! To start accruing savings on eligible bookings, as well as accessing special perks and bonus offers, all you need to do is join CheapCash after you sign up for free or log in — being thrifty has never been simpler! We get the message — you've already dropped enough of your precious dough on this trip, so you don't want to be spending a fortune on cabs. 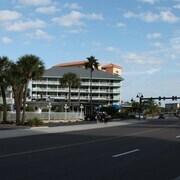 Luckily, Clearwater Beach has some quality car rental outlets which ought to ease the load on your bank account. If you're keen to start the adventures as soon as the plane lands, rent a car from the Tampa International Airport area. Located in the immediate vicinity, Thrifty Car Rental and Dollar Rent A Car will sort you out. Budget is just 2 miles from the middle of town at 801 Cleveland Street. So if you're eager to immerse yourself in the city streets, you know where to head. If they don't have anything suited to you, you can contact Avis at 801 Cleveland St. This handy rental outlet is 2 miles from the city center. 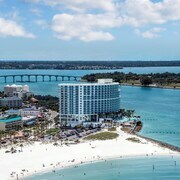 With no less than 65 hotels in Clearwater Beach, you won't have any difficulties finding a cheap and cheerful place to stay. 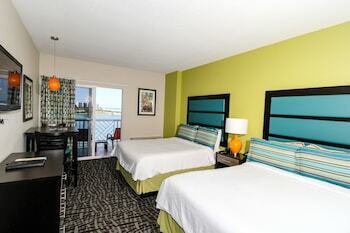 Secure a comfortable room and then start arranging the fun stuff! Why pay more when you don't have to? 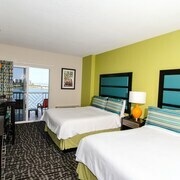 Book a room in one our cheap options like the Sta 'n Pla Marina Resort or The Beachview Hotel.